National Workplace Wellbeing Day aims to improve overall employee wellbeing through promoting better exercise and nutrition in the workplace. What benefits does National Workplace Wellbeing day offer? Workplace Wellbeing creates a safe and healthy work environment which improves staff morale, increases productivity and reduces absenteeism. In 2016, 300+ companies in Ireland varying from SME’s to Multinationals participated in National Workplace Wellbeing events. 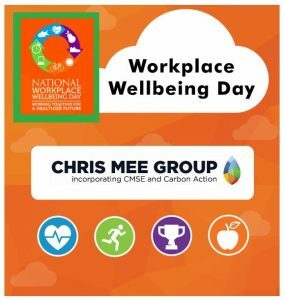 As part of our ongoing Workplace Wellbeing Wellness Campaign, Chris Mee Group have a number of activities planned. On Friday, March 31st we at Chris Mee Group will host a health talk on the topic of Stress for all Personnel including Staff, Contractors and those on Placement through CMSE Recruitment. Chris Mee Group will also be Sponsoring Healthy Food options at break times. Let us know how Your company is getting involved with Workplace Wellbeing Day 2017! Click here to view our services.